BBC R&D experiments with higher frame rate television broadcasts | What Hi-Fi? 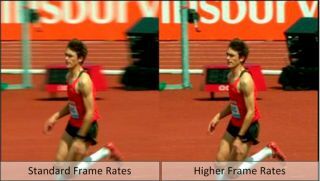 BBC's Research and Development team demonstrated higher frame rate technology at the recent Commonwealth Games in Glasgow, with the intention of highlighting the benefits of watching live sport at higher frame rates. The TV that currently sits in your living room, kitchen or bedroom receives its signal from a TV aerial, cable or satellite at 25fps (frames per second). And that programme may have originally been shot at a higher frame rate, but alas your TV isn't able to process it and therefore has to 'guess' what's happening to create new frames. Now, however, the BBC is aiming to broadcast signals of a higher frame rate in the future, and it recently held a large scale public demonstration at the Glasgow Science Centre during the Commonwealth Games. For its demo, the Beeb recorded video footage on a Ultra HD 4K video camera - shooting at 900fps. But the size of the uncompressed files meant that it had to be slowed down to 50fps to extract the footage. After it was replayed on two projectors at 100fps and 50fps, public reaction was positive. Many could see that higher frame rate vastly improved sports action. It seems the next step is now to find a way of broadcasting higher frame rate video and produce TVs that are capable of handling it. BBC R&D is continuing its research into the area and the hope is that, one day, we'll all be able to enjoy the improvements from this new broadcast system.